The David Morrell Network – Website Development | ASTRALCOM - Content Strategy, Conversion Marketing and Customer Acquisition. The David Morrell Network – Website Development | ASTRALCOM – Content Strategy, Conversion Marketing and Customer Acquisition. 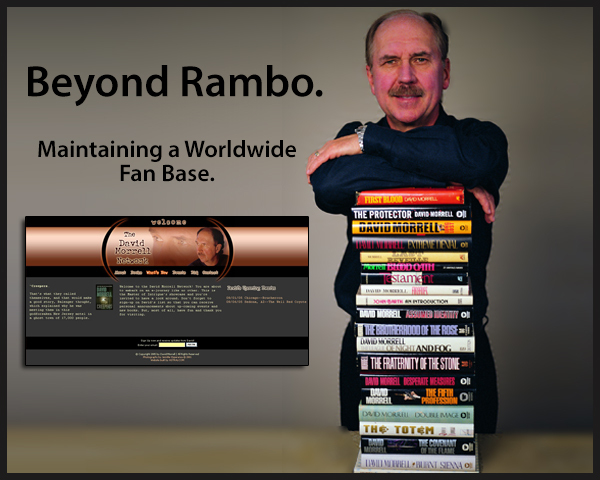 As the creator of the “Rambo” character and also the main influence of the subsequent Rambo movies, David Morrell contacted ASTRALCOM to help in developing an effective fan attraction and retention platform. As a primary means of maintaining contact with David’s worldwide fan base, we created and developed a robust solution that included several content management solutions (CMS) and customer relationship management (CRM) elements to help him effortlessly keep in contact with his fans. David was able to post book signings and other events of interest. Fans could get their questions posted and answered by David and he could send all his registered fans periodic announcements. Prior to this new digital business solution, David wasn’t really able to connect with his fans. This solution enabled him to maintain close contact with his fans all across the world and involved them more in his future writings and releases. This also enabled David to organize his published writings for easy reference and access on the website and also provided his fans with an in-depth collection of David’s total works. Keeping in touch with – and engaging – your fans, constituents, or customers is critical to the success of your business or your personal brand. Hook-up with ASTRALCOM and we’ll create the perfect solution for your growth needs.